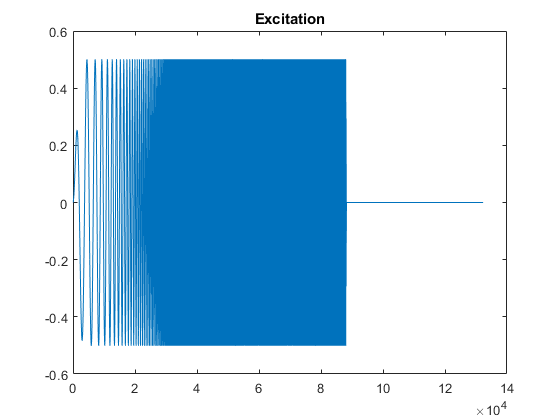 excitation = sweeptone() returns an excitation signal generated using the exponential swept sine (ESS) technique. 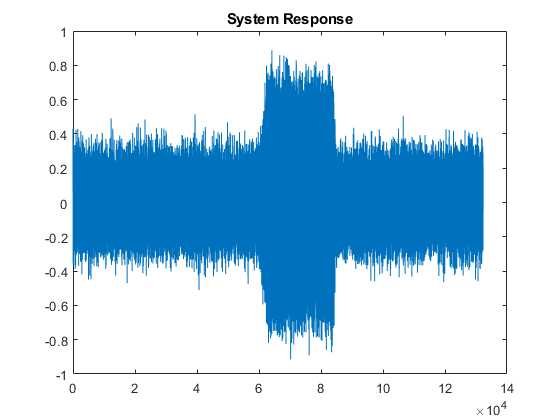 By default, the signal has a 6-second duration, followed by 4 seconds of silence, for a sample rate of 44100 Hz. excitation = sweeptone(swDur) specifies the duration of the exponential swept sine signal. excitation = sweeptone(swDur,silDur) specifies the duration of the silence following the exponential swept sine signal. excitation = sweeptone(swDur,silDur,fs) specifies the sample rate of the sweep tone as fs Hz. excitation = sweeptone(___,Name,Value) specifies options using one or more Name,Value pair arguments, in addition to the input arguments in the previous syntaxes. Generate an exponential swept sine (ESS) signal with a 3-second sweep that goes from 20 Hz to 20 kHz, and ends with a 2-second silence. Specify the sample rate as 48 kHz. Visualize the excitation in time and time-frequency. 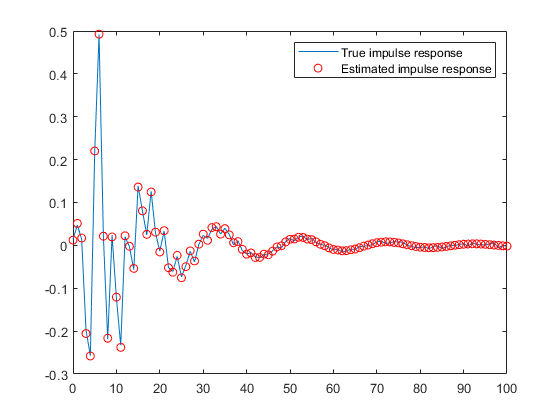 Duration of exponential swept sine signal in seconds, specified as a scalar in the range [0.5,15]. 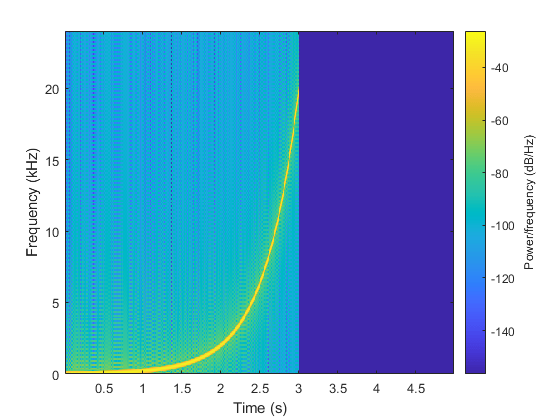 The total duration of the excitation signal must be less than or equal to 15 seconds: swDur + silDur ≤ 15. Duration of silence after exponential swept sine, specified as a scalar in the range (0,14.5]. Sample rate in Hz, specified as a positive scalar. Range of sweep frequency in Hz, specified as a two-element row vector. The sweep frequency range can be specified low to high or high to low. That is, [10 22000] and [22000 10] are both valid inputs. The largest value of the sweep frequency range must be less than or equal to fs/2. 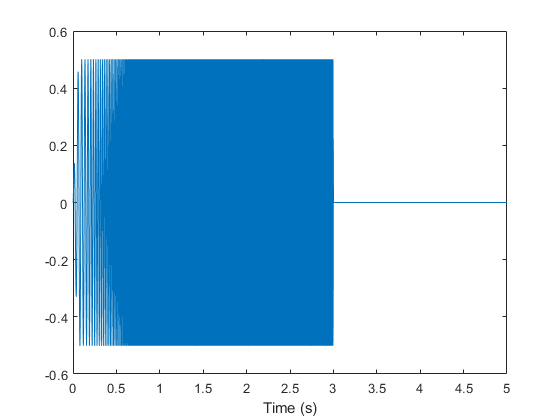 Excitation signal generated using the ESS technique, returned as a column vector. The length of the column vector is approximately (swDur+silDur)*fs samples.